Conservatives spend a lot of time whining these days about how Barack Obama is always blaming them for all the problems he faces. Personally, though, I’d say Obama has been remarkably restrained about the whole thing, especially when it comes to our disastrous fiscal situation. 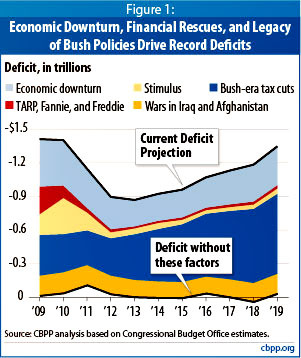 In a mere eight years, George Bush and the Republican Party managed to take a thriving economy and a federal surplus and turn it into a hair’s breadth escape from Great Depression II and an endless fiscal sinkhole. Rome may not have been built in a day, but it didn’t take much longer than that for the modern Republican Party to bankrupt America. While President Obama inherited a bad fiscal legacy, that does not diminish his responsibility to propose policies to address our fiscal imbalance and put the weight of his office behind them. Although policymakers should not tighten fiscal policy in the near term while the economy remains fragile, they and the nation at large must come to grips with the nation’s deficit problem. But we should all recognize how we got where we are today.